FACT CHECK: Trump's Pledge To Restore 'Merry Christmas' To The White House President Trump took part in his first National Tree Lighting Ceremony Thursday. Trump has pledged to ditch political correctness and bring back Christmas, but did it ever leave the White House? President Donald Trump speaks during a rally on Wednesday in St. Charles, Mo. One of the nation's oldest holiday celebrations took place Thursday evening on the Ellipse next to White House — the annual lighting of the National Christmas Tree. It is a tradition that dates back to the Coolidge administration in the 1920s and was President Trump's and first lady Melania Trump's first time taking part in the event since moving into the White House. The ceremony comes a day after the president reiterated a pledge he's echoed many times since becoming a candidate in 2015 to end the so-called war on Christmas. 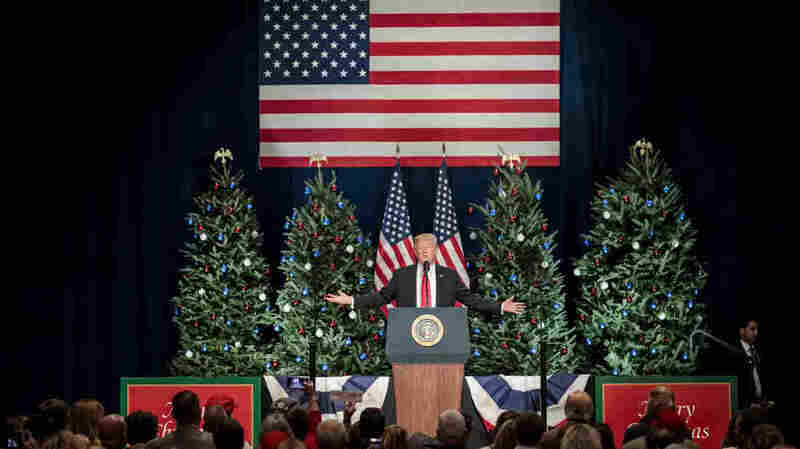 At a speech Wednesday in Missouri to publicize the GOP tax overhaul expected to come up for a vote in the Senate this week, President Trump kicked off his remarks by saying: "I told you that we would be saying Merry Christmas again, right?" Here's a closer look at the president's claim. "With Trump as your president, we are going to be celebrating Merry Christmas again, and it's going to be done with a big, beautiful tax cut." While it is still unclear if congressional Republicans can deliver that tax overhaul Trump is so eager to sign into law, checking to see if "Merry Christmas" actually left presidential vernacular is a bit easier to answer. President Trump's charge that "you don't see Merry Christmas anymore" appeared to be directed at his predecessor former President Barack Obama and the apparent claim that Obama seemed to favor the more inclusive seasonal phrase "Happy Holidays." "The Trump family's first Christmas card contains a word that was noticeably absent from all eight of Obama's Christmas cards: CHRISTMAS!" Todd Starnes of Fox News earlier this week penned an article thanking Trump for bringing "Merry Christmas" back to the White House. But a quick search of the Web and social media returns many examples of when Obama used the phrase "Merry Christmas." In fact, in his weekly address on Christmas Eve 2016, literally the first words out of the former president's mouth were: "Merry Christmas, everybody." In 2015, Obama tweeted "Merry Christmas, and happy holidays to you and yours." In 2014, Obama tweeted "Have a merry Christmas." And in 2013, Obama went with a simple "Merry Christmas." As one journalist pointed out on social media this week, the Obama administration said "Merry Christmas" annually for eight years. 12/22/12:"Michelle & I want to wish u a Merry Christmas"
Well, perhaps Trump was suggesting the George W. Bush administration did not say "Merry Christmas"? Nope, that administration did so too, including in 2008 when former President Bush spoke to U.S. troops stationed in Iraq. How about the Clinton administration? President Bill Clinton did so too. So the reality is, as best we can tell, "Merry Christmas" never left the White House.